It was the city fiesta of Dumaguete and we found ourselves in front of Soban Korean Restaurant for dinner. We’ve been hearing that they serve good (Korean) food. And being the foodies that Yodawan and I are, we decided to give it a try. When we got in the first thing I noticed was–KOREANS! I have no clue what ‘authentic’ Korean dishes are supposed to taste like coz I’ve never been to Korea. But seeing that there were Koreans eating (and enjoying their meal) is definitely a good sign. We did not know what to order. Seriously. So we asked our waitress what to get–what the best sellers are and stuff like that. 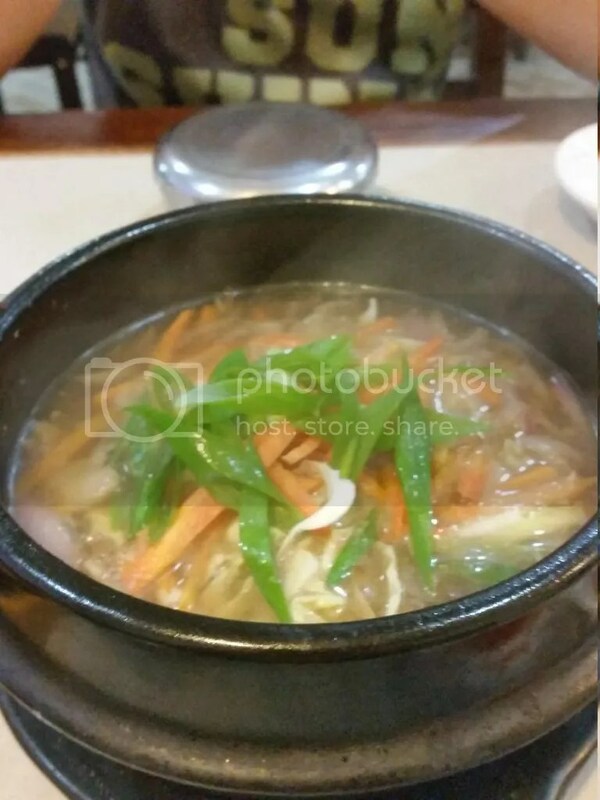 She recommended Bulgogi Ddukbaegi (soup) and Jeyuk Bokeum. My apologies for the crappy pic (I’ve been using the S5 for a few months now and I still do not know how to use the camera–nyahahaha). The only side dish that I can name is the Kimchi. The cucumber one is really good too. The radish–I didn’t give it a try (the middle one) since I don’t like radish. Nothing to do with the restaurant. The one on the lower right is an eggplant side–it was also good. Forgot about the one on the upper left–I think it’s the equivalent to the Filipino atchara (yum!). And then we got our main dishes. Korean hot tea was ‘supposed’ to be served but we didn’t get a pot. Anyway, it’s fine–just because I’m not really fond of teas (Korean, English, or whatchamacallit). It is NOT TRUE that ALL Korean dishes are hot and spicy. The soup that we ordered was actually kinda sweet–in a good way, and it was not spicy.Definitely hot coz I burned my tongue (laughing here). There were lots of beef as well as sotanghon noodles. The Jeyuk Bokeum was really good and it was not out-of-this-world spicy. The serving is also enough for 3 people (they say it’s good for two). Between Yodawan and myself, we had a hard time finishing up the meal. And because I did not pay attention to the writings on the wall (more like signage), I ordered soda for Yodawan and myself. After we got the soda, they served the iced tea (comes with the Soban experience). 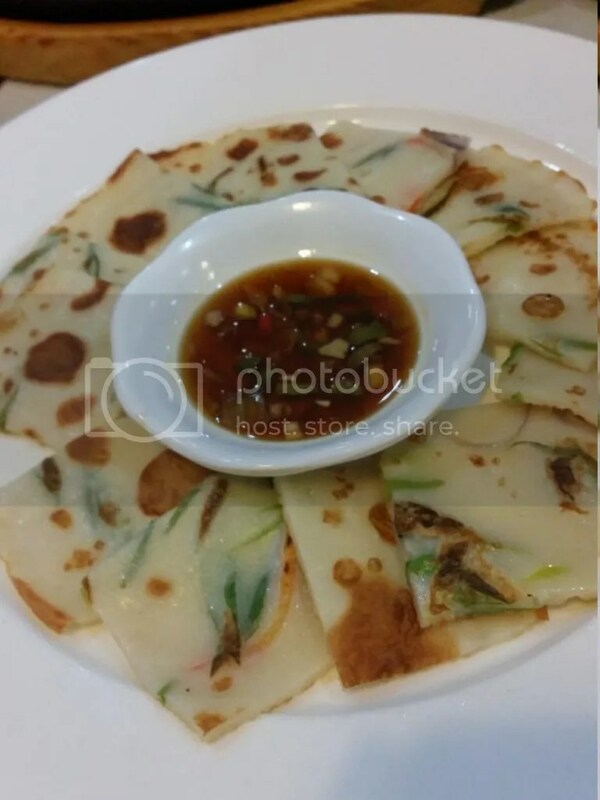 After the meal, they served a pancake dish. I have no idea what they call it. We couldn’t finish it. We were so full. 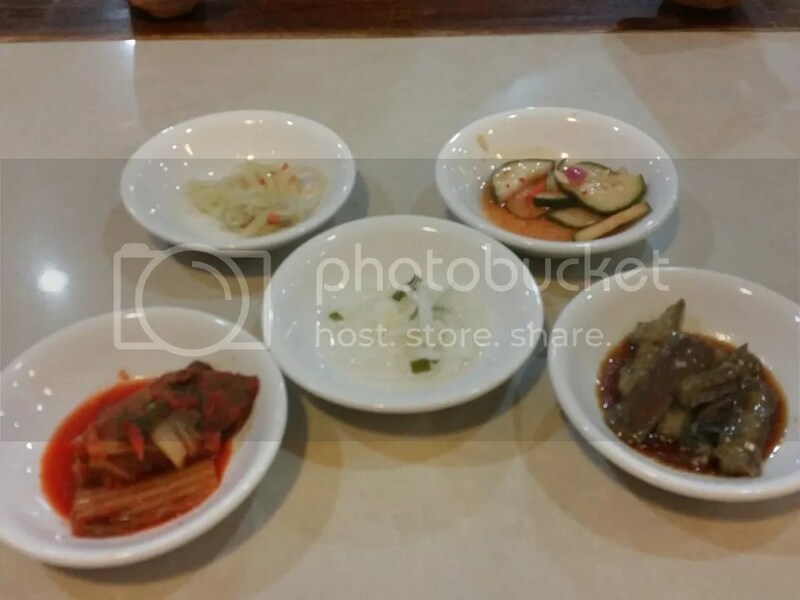 I’m giving Soban Korean Restaurant 4 out of 5 stars. They can improve on explaining to new customers what they are serving. It was very clear it was a first time for us–and I mentioned it too. When they gave the sides and also the pancake, they just put it on our table without saying anything. The food itself is really good and I definitely want to go back and try the other dishes. The place wasn’t fancy and I don’t think there’s a need for it to be. They can work on the exhaust though–when we got out, we smelt like Korean food (I’m unsure if it’s part of the dining experience). 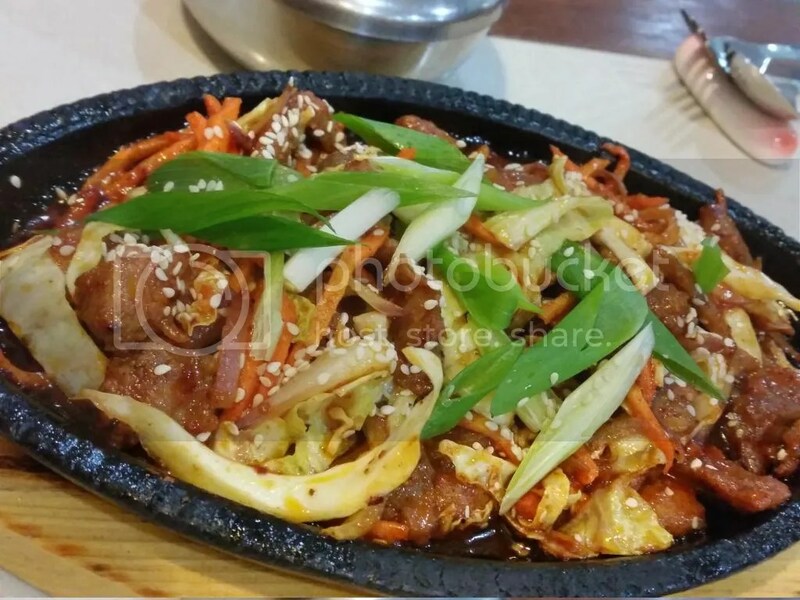 If you’re in Dumaguete City and you’re craving for Korean food (this is NOT FAST FOOD, and they tell you that too), head over to Soban Korean Restaurant which is located near the Provincial Hospital. For more information, you can check out their Facebook page.